The image of Hillary Clinton and Bernie Sanders embracing was the moment that seems almost impossible a couple of months ago when Sanders was still painting Clinton as an old-school moderate, closely tied in with the Wall Street crowd. But in the past month, as democrats became more concerned about Donald Trump's momentum, the pressure for Sanders to get behind Clinton grew stronger, culminating in these words from Sanders at a Portsmouth, New Hampshire high school on Tuesday. 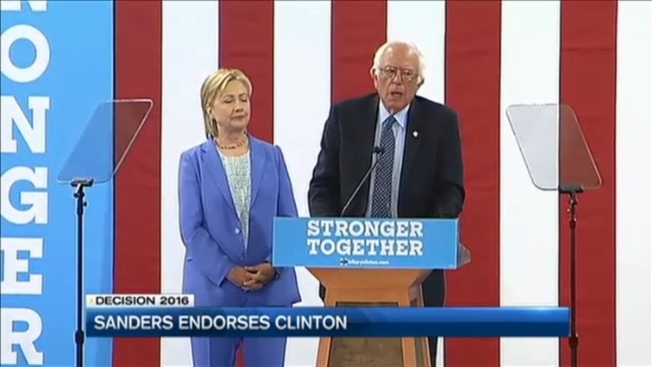 "I have come here to make it as clear as possible as to why I am endorsing Hillary Clinton and why she must become the next president of the United States," said Sanders. Clinton, who was pushed by Sanders to take more liberal positions then she might have, was happy to let bygones be bygones. "Thank you for your endorsement, but more than that, thank you for your lifetime of fighting for injustice," Clinton told Sanders. But some Sanders supporters are finding it very hard to move forward. "I believe he was coerced into telling us to vote for her," said Sanders supporter Audrey Murphy. "I think Hillary is a very evil and corrupt woman and will do anything she can to get her way. I will never, ever vote for Hillary." Kathleen West describes herself as a Bernie or bust person adding that despite being a lifelong democrat, she is just not ready yet to support Clinton." In fairness, most Sanders supporters, while disappointed, say they are fully on board now with Clinton because they will do anything to prevent Donald Trump from becoming the next president.